We published An Ecobardic Manifesto in 2008. Here is an extract from the opening page of An Ecobardic Manifesto. The world is in crisis. It’s been in crisis before. Individual regions have suffered environmental collapse. The planet has undergone global ecological crises in the deep geological past. But in our time we’ve become aware that for the first time during the history of civilisation the world faces such a global ecological crisis – one caused not by asteroid impact or the slow cycles of plate tectonics or celestial oscillation, but by the accelerating exploitation of the earth’s resources by an ever growing human population. In such a crisis what place is there for the arts? We believe it’s time for the arts to respond whole-heartedly to the ecological challenges facing our planet. In place of the commodification of alienation, we need to celebrate connection; in place of intensifying polarisation between entrenched dogmatisms, we need to foster respect for otherness and diversity; in place of self-interested denial, we need to promote engagement with ecological reality. (5) re-enchanting nature and existence as filled with significance. This Ecobardic Manifesto is, firstly, our own mission statement as a group of performing artists and writers. But it’s much more than that. 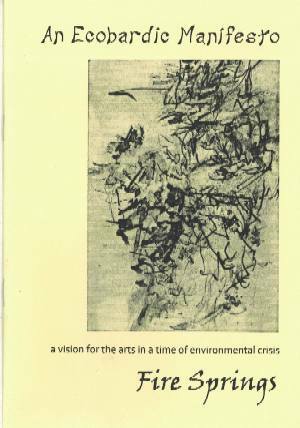 It aims to draw attention to groundbreaking ‘ecobardic’ work that many other artists have already done. And, by making our artistic intention conscious and public, we hope to provoke and inspire yet others. From little acorns, mighty oaks may grow.